Rogue Ales from Oregon have always been exactly that, Rogue! These guys don’t always play by the rules, and have established themselves as an infamous leader in the craft beer world, among other things. Not only does Rogue make beer, they make Spirits, Sodas, and Ciders. They also have a number of bars/brewpubs in Oregon, California, and Washington. Oh, I forgot to mention that they also own and operate their own farms where they grow all their own malting barley, rye, hops, and specific fruits, nuts and vegetables native to Oregon. They even raise their own chickens, potbellied pigs, turkeys, and honey bees. These crazy fuckers even harvested yeast from their owner’s beard to make Beard Beer, which I still need to try! One of their other wild ideas was to team up with the over the top doughnut shop, Voodoo Doughnut, also from Oregon. Just take a look at their website to see their Frankenstein monster creations. 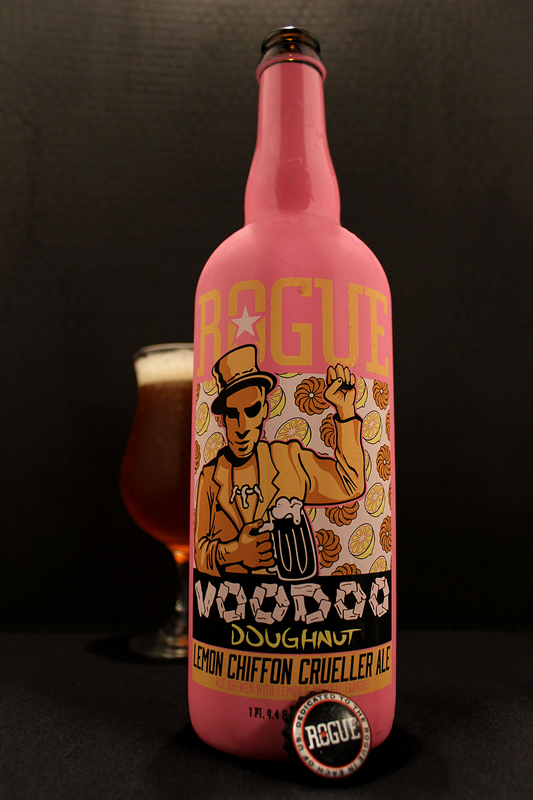 Since around 2011, Rogue Ales have released four different beers, which were based off the ingredients used in some of the wild donuts from Voodoo Doughnut. The very first one released was my least favorite, and was had way before the website was launched. This was the Voodoo Doughnut Bacon Maple Ale, which on Untappd, I gave it a 3/5 rating. The next couple in this series were reviewed for this site; Voodoo Doughnut Chocolate, Peanut Butter, & Banana Ale, and Voodoo Doughnut Pretzel, Raspberry, & Chocolate Ale. Here is the latest beer released in this wild and crazy series. Based on the shop’s Lemon Chiffon Crueller Doughnut, which is their version of a French Cruller that is topped with vanilla frosting, lemon dust, and three marshmallows. Seeing as I live in Texas, I am unable to actually taste these amazing creations, but I am assuming that these beers from Rogue are the closest thing to the actual taste of these donuts. In the typical fashion that Rogue has given to the Voodoo Doughnut beers, this beer comes in a 22 oz bomber bottle that is colored bright pink. It is definitely a stand out on any store shelf, that’s for sure. The logo of this beer features the Voodoo Doughnut logo man in a lemony yellow color, and holding a pint of dark beer. Behind him is what looks like wallpaper with French crullers and lemon halves throughout the image. The Rogue logo and other highlighted areas and words are all in a bright yellow color which really brightens up this already bright bottle! The appearance of this beer was a semi-hazy bright orange/yellow color and topped with a half inch white foamy head, which looked rather tasty sitting in the tulip style glass I poured this in. After the initial pour, the head did quickly disappear, leaving no lacing at all down the glass. The aroma was unique, leading with a strong lemon peel, and lemon juice scent. As the acidic lemon smell faded, my nose was met with hints of chiffon sponge cake, cruller doughnut, sweet icing, heavy cream, vanilla, and marshmallow. There is a small trace of grains, and fresh baked white bread as well. Just as the nose, the taste of this beer features a lot of the same characteristics. Right away I can pick up on the lemon peel and lemon juice flavors, followed by the sweet flavors of cake and donuts like sweet icing, heavy cream, vanilla, marshmallow, chiffon sponge cake, and actual cruller donuts. Even though the flavors of lemon hit me right as this drink hits the palate, the taste lasts throughout the drink, and even lingers in the throat after each drink taken. For me, the taste of marshmallow, and icing also linger alongside the lemon in the aftertaste. This one had a nice medium body, low carbonation, and a mouthfeel that was oily that also had an acidic bite to it. The finish is where the acidity shined with the lemon flavor being dominant in the aftertaste. Overall, I am impressed with the creativity put into this beer. I’m sure the process of choosing which donuts to try to make into a beer is a fun process for these guys, but also a challenging one, as well. I have always really liked eating French Cruller donuts. I was interested in this beer once I heard about it. I mean, come on, lemon, vanilla beans, marshmallows, how could this not be good, right? Unfortunately, this one did fall short to a perfect score for being a bit too sweet, and having a little bit of an artificial flavor to the overall taste, plus the low carbonation. I did actually give this beer the highest rating so far from the beers in this Voodoo Doughnut series. If you really dig dessert beers, then definitely try this one out for yourself. Don’t be afraid of it. Now, after I went through the doughnut list on Voodoo Doughnut’s website, I am very curious to know which one Rogue Ales will dive into next. I have my choice for the one I would like to try; maybe the Mexican Hot Chocolate Doughnut, which is a chocolate cake doughnut dusted in cinnamon sugar and cayenne pepper, or the Mango Tang Doughnut, which is a raised yeast doughnut filled with mango jelly and topped with vanilla frosting and tang. Ugh…So Many choices!!! Metal Connection: For those who know me personally, will already know that I am a fan of most things Metal. Usually in every sub-genre of Metal music, I will find at least 1 band that I can tolerate and enjoy. Over several years there has been a style that has evolved into what the “experts” have called Stoner Metal, which of course is modern day Heavy Metal or Doom Metal. It is a slow style relying on really heavy riffs and catchy hooks. This leads me into my choice for the Metal Connection for this beer review. This connection works in so many ways. Ladies and gentlemen, let me introduce you to a fairly new band named Heavy Voodoo, which happens to come from Portland, Oregon, the same area as our beloved Rogue Ales and Voodoo Doughnut. I think the Beer Metal Gods were leading me to discover this band for this very review. This is my first encounter with this band, and I am thoroughly impressed by their music. Luckily I was able to find a link I could use here. This song, “Graveyard Shift” is 1 of 3 songs on their 2014 EP, Cursed is the Serpent, which was an independently released digital download. I can hear a lot of good influences in their style of playing. Of course, Black Sabbath comes to mind, but this always seems to be the case with any Doom, Stoner, Heavy Metal band. I can hear a little Trouble as well. This is just a good head banging god tune full of heavy and catchy guitar playing, pounding drums, and catchy vocal patterns, which will have you wanting to learn the lyrics pretty soon so you could sing along with the track. Two of my favorite things are finding, discovering, or getting shipped new beers not easily fond where I live, and the other is discovering new talented Metal bands of all kinds. Cheers my friends!